Public Relations is changing, and in 2018, it’s going to change more rapidly than ever before. 2017 saw the unprecedented emergence of multiple major trends that will change the way brands relate to their consumers, and also proved that most businesses no longer know how to handle the rapidly evolving PR ecosystem. Failure after failure saw businesses humiliated over and over again in a very public fashion, and in most of these cases, new forms of media far outstripped the ability of traditional media to keep pace. The businesses themselves were lagging behind both. If you’re going to learn anything from this, and avoid such PR disasters yourself, you have to analyse the changes and walk into the new year with your eyes open. Don’t worry, we’re going to stay positive, and focus on the opportunities that are in front of you. Existing trends are about to blow up. New trends are about to emerge. Old mainstays are falling by the wayside. The game is changing, and you need to know the rules if you’re going to win. When you play the Game of Thrones, you win or you die. The Game of PR is little different. Let’s get your business the crown it deserves. Here are the five biggest trends to look out for in the coming year. I’ll show you how to be ready to catch those waves and ride them to new levels of success. 1) The Press Release Is Dead. Long Live The Press Release. The traditional press release is dying a slow death, according to some. Journalists are facing greater demands on their time than ever. More people are competing for attention than ever. PR newswires are constantly evolving to changing condition in the industry. they’re written to aggrandize the company not to help the journalist. The way press releases are written wastes journalists’ time and is even less attractive to the public, as it often has a formal, standardized tone instead of the tone of voice that might be associated with public-facing marketing. So why do them at all? They set the parameters of your story – in writing a press release, you have to crunch the information, sharpen the idea, and come up with an angle. These are all useful drafting tools for further campaigns. As an internal document it can help people understand how to communicate about certain developments, and when public facing, it can create an anchor or point of reference for the broader campaign. They contribute to longitudinal visibility – that is, if you have a press release out every couple of weeks, those who follow your social media, website or the newswires will see the momentum and repeated successes of your company as a reason for confidence. Increasingly people use press release campaigns as a tool to attract investors. Supplement – if you can avoid all the pitfalls I listed above, a press release can be a great supplemental tool to help journalists fill out the details in their story. You have to think like a journalist, and include what’s helpful to them in the way that is helpful to them. True facts – I’ve scored several high profile wins by writing the press release as a finished article – for smaller fish, saving them time and giving them a professionally written article that needs no work to get a credit can help you take advantage of their platform. This is my start up. It competes with this company. It does this better than them. We’re doing X next week. It’s exclusive to you if you want it. The sentences really shouldn’t be much longer than that. Iffy voice acting aside, it gets across what the car looks like, it’s unique features and advantages, before going into a more traditional discussion of what journalists will find helpful to talk about. On the other hand, it also has the line, “we didn’t just explore your emotions, we listened to your mind” WHAT? So what I’m saying is, there’s room to create better video press releases than the ones already making waves. And it’s a good idea. A recent client, who makes video press releases, pointed out that Press Releases With VIDEO Gets 55% More Views Than One Without. Worth considering. The Press Release isn’t dead – it’s evolving. Thought leadership is something we’ve written about before, and with good reason. Identified as one of the hottest emerging trends of 2017 in PR, it’s now a must for any business that needs to punch above their weight in order to attract a much needed spotlight to their business. Becoming a thought leader helps you establish yourself as an authority in a specialist field. Being a thought leader means sharing deep, original insights into that field, that have been thoroughly researched and supported with evidence. Steve Jobs, Elon Musk, James Dyson, Bill Gates. They’re names you know because they are thought leaders and pioneers in their industries. While you may not be able to get to the same level they’re at, you can still rise to dominate your niche. By sharing valuable content, unique insights and specialist perspectives of the challenges and opportunities of your niche, you can demonstrate your expertise without being overly promotional. Guest speaking opportunities, sharing your commentary on things that affect your industry – these are all ways to get your brand name in front of people. Here are my 10 Essential Strategies To Become A Thought Leader In Your Industry. All this said, thought leadership takes time, commitment and expertise. It’s not the same as personal branding, which remains popular, but can be achieved through softer impressions such as likeability, attractiveness, visible success cues, and charismatic delivery. A personal brand can help give a company a face and a voice, humanizing the organisation for audiences. But as Subway’s Jared has scarily shown, and more recently Harvey Weinstein, the company can be severely damaged by the wrong personal brand. Influencers are a new breed of celebrity in PR trend, but unlike the fickle and often aloof celebrities of old – the film stars and millionaires who tout aspirational lifestyles – these influencers appear for all intents and purposes to be heightened versions of ordinary people. They create their following through being relatable, and as a result, their power to influence others (hence the name) is significantly more useful to brands. In 2017 companies saw major successes with influencer marketing, suggesting that when targeting both male and female consumer markets, particularly in the millennial demographic, the strategy could be highly effective. This news does come with a bitter chaser however – there were some pretty baffling failures along the way. There’s a right way and a wrong way to do influencer marketing, and then there’s the new way. If you check both the articles linked above, you’ll see there are several key takeaways. Perhaps the most importance of these is not to automatically assume the number of followers will convert into anything significant for your business. Rather, the level of influence and engagement within a niche is the most important. It’s also worth mentioning that this niche should be relevant to your business (you’d be surprised). Influencers can be highly effective if they’ve been thoroughly researched and vetted, carefully selected, and align strongly with the brands existing or aspirational values. Putting influencers to work promoting a brand works best when it’s seamless, even if that means starting small. Ultimately, trust in business and in the media is at an all-time low, and influencers are highly trusted individuals within their spheres. Co-opting that trust should be done to repair or build a reputation, not to try and trick consumers. Big Data was a buzzword in 2016, and in 2017 it started to become a reality. In 2018, we’ll see the new applications of big data, and possibly start to identify some of its limits. Data is, after all, only as good as the interpretation, and that process will always be flawed to some extent. What’s most interesting about 2018 is the way PRs themselves can leverage big data to shape their focus and communication. Social listening initiatives and the like have already proven their worth, so here’s how I see things shaping up this year. The most immediate use of big data is to develop market insights. PR firms can use APIs to dredge huge amounts of data from social media sites, which can then be interpreted and investigated to identify emerging trends, current perspectives and even analyse competitor performance. This can enable PR pros to create more targeted marketing strategies. There are less obvious things data can help us determine, such as when people are most active, when there are the most people online, what types of content people prefer on what channel, and more. Above and beyond this, Big Data can be used to pro-actively stage interventions before a crisis even happens. Imagine you are crunching customer responses and see a sudden spike in complaints – cross referencing these, there’s a consistent theme to them all. Identifying this in the embryonic stage allows you to get ahead of the story. Finally, big data can be used for performance tracking. Once you’ve identified opportunities and created a targeted campaign, you can then see if your interpretation of the data has led to the results you wanted. Remember however, qualitative data will always beat quantitative for insight and actionability. Related to my previous item, big data can even help in reputation management, analysing the web for mentions of your brand and identifying anything that might be critical of your company. In 2017, everyone from brands to governments were slow to react to emerging crises, and it cost them dearly in terms of their perception. Reputation management is a form of so-called real time PR, which requires near-immediate responses to growing issues in order to head them off at the pass and ensure the brand retains agency and control over the way the story develops. How effectively a brand responds to an incident will define how the public perceive that brand. It’s important to remember, you are not in control of how the public sees your company. Crises, incidents and controversies can do a lot of harm, but a sudden swell in positive reaction that goes unexploited can also result in wasted potential and under performance. The internet transmits data at the speed of light, and people consume greater volumes of information than ever before. The ability to be agile and robust in your immediate responses earns you trust and respect, and it demonstrates a form of authenticity. It is relatively simple to catch people out in a lie, so be honest. Transparency should be a core brand value for all businesses in 2018. And if you can’t be transparent, you need to take a long hard look at why, and decide what future implications that could have for your business. We live in an age where people demand instant responses from businesses. If you can’t keep pace, you risk being left behind. PR is not optional anymore. It is not added-value anymore. It is integral to the success of any business, and it must be fully integrated to succeed on the level it needs to. Currently a PR department doesn’t report directly to the CEO, but I predict we’ll start to see that changing in the trend. PR was siloed off in its own world, pursuing its own objectives. Now, in an omnichannel world, PR needs to be bred into the fabric of every channel. PR is no longer a pawn, it’s the board. Its pieces are more varied than ever too: every one of the five things on this list is its own specialist discipline, meaning you’ll need outside help if you’re going to succeed in every avenue. And it will be worth it. 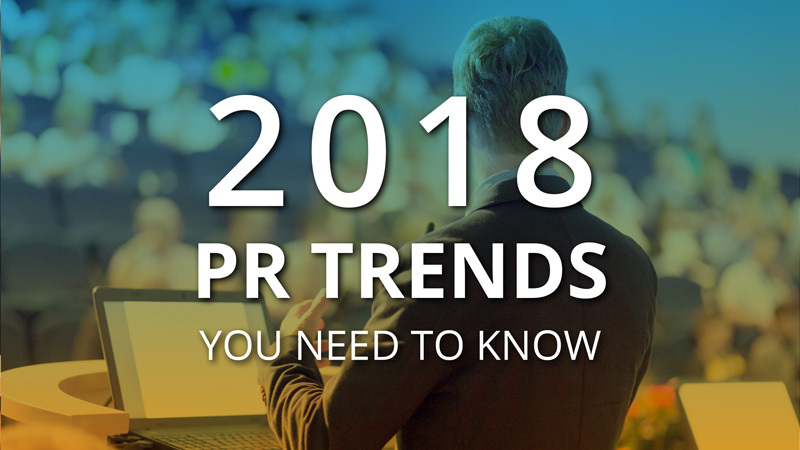 If you can stay up to date on the current trends in public relations and incorporate these 2018 PR Trends into your PR strategies, you will bring your business to the next level. Jeff Teh is the Client Success Coach. He helps clients in business development, strategic planning and conducting effective marketing actions for their businesses. Jeff is also passionate in delivering presentation and sharing knowledge.